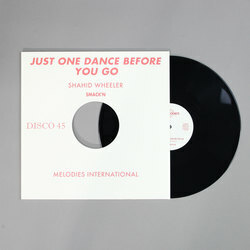 Shahid Wheeler - Just One Dance Before You Go. Vinyl 12. Bleep. Another excellent reissue from Melodies International here. This latest drop fits neatly into the label’s run of disco-soul gems that has included Le Stim’s ‘A Tribute To Muhammad Ali’ and Majik’s ‘Back Into Your Heart’. ‘Just One Dance Before You Go’ was written in 1978 by James Hartnett, the Hosanna man who was on a roll after his 1976 track ‘Hipit’ became a hit in the Northern Soul clubs. 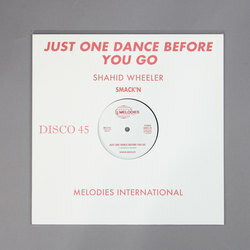 He drafted in his pal Shahid Wheeler to lay down the vocals for his new tune, and Wheeler’s strong falsetto gives this fast, funky number that feeling of freedom which characterises the best golden-age disco tunes.